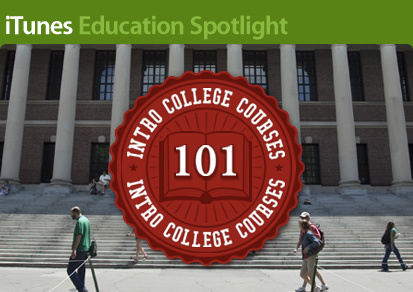 Download introductory college courses from iTunes U to explore a university education or simply quench a thirst for knowledge. Areas of study include business, engineering, humanities, mathematics, and more. The Open University squeezes 1600 years of history into 10 one-minute bites, uncovering the sources of English words and phrases from Shakespeare and the King James Bible to America and the Internet. Get ready to go back to school with apps to help organize your classes and homework, master subjects, create great-looking reports and spreadsheets, and more. The Naked Roomate is the essential guide to everything you need to know about college, including how to manage your money and stress, learning to share a bathroom with strangers, and more. The iTunes Store, iBookstore, and App Store are available only to persons age 13 or older and in the U.S. iTunes 10 or later, compatible hardware and software, and Internet access (fees may apply) are required. Books require iBooks 1.3 on an iPad or iOS 4 device. Some content has specific hardware or software requirements; please review product information before purchasing. Full terms apply, available at www.apple.com/legal/itunes/us/terms.html. For more information see www.apple.com/itunes/. Content prices and availability subject to change.